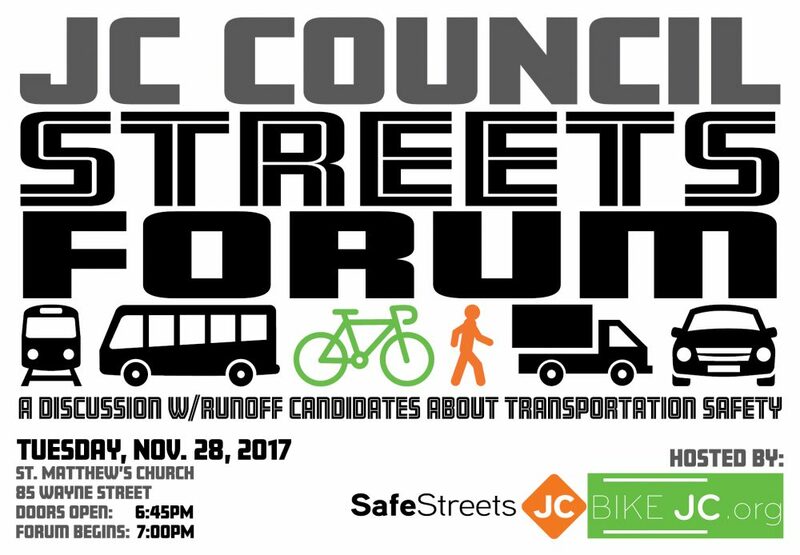 Our JC Mayoral Streets Forum was such a great success, that we’re partnering with our allies at Bike JC to do this again for the run-off council seat race. All of our Council members must work together to make true Complete Streets and Vision Zero a reality city-wide – it’s crucial we elect people to the Council who are proactive and lead on these key issues. 4 Ward Council Seats are still up for grabs in the Dec. 5th Election. We’ve invited these 8 candidates from Wards A, B, C & E to participate in our Forum. We’ll ask them about Transportation & Traffic Safety and Access and about their visions to make the city safer and more accessible to all citizens across all modes of transit, including pedestrians, bicycles, motor vehicles and public transit. More info here. Doors at 6:45pm, Forum starts at 7pm. * Just 2 blocks from Grove St. PATH station, numerous bus lines, and CitiBike stations. Public parking can be found in the city lot off Montgomery adjacent to City Hall (just a 3 block walk to the church). Surveys for the Run-off Council Candidates for Wards A, B, C, E.